New research has shown that an exotic kind of magnetic behavior discovered just a few years ago holds great promise as a way of storing data—one that could overcome fundamental limits that might otherwise be signaling the end of "Moore's Law," which describes the ongoing improvements in computation and data storage over recent decades. 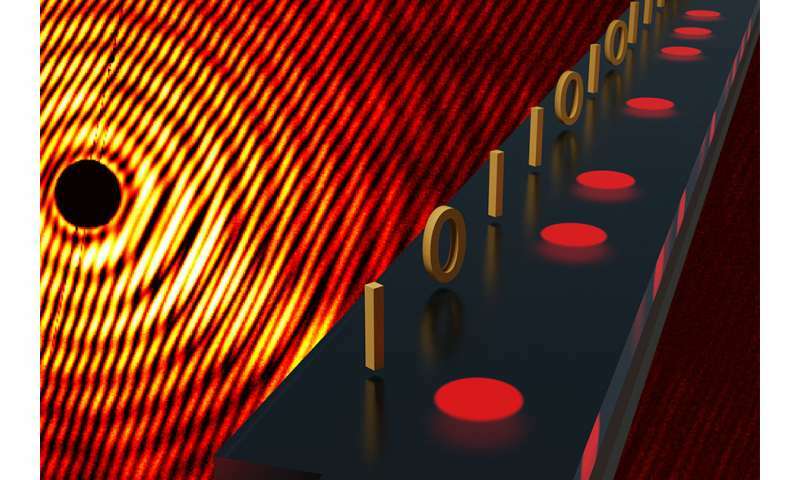 Rather than reading and writing data one bit at a time by changing the orientation of magnetized particles on a surface, as today's magnetic disks do, the new system would make use of tiny disturbances in magnetic orientation, which have been dubbed "skyrmions." These virtual particles, which occur on a thin metallic film sandwiched against a film of different metal, can be manipulated and controlled using electric fields, and can store data for long periods without the need for further energy input. In 2016, a team led by MIT associate professor of materials science and engineering Geoffrey Beach documented the existence of skyrmions, but the particles' locations on a surface were entirely random. Now, Beach has collaborated with others to demonstrate experimentally for the first time that they can create these particles at will in specific locations, which is the next key requirement for using them in a data storage system. An efficient system for reading that data will also be needed to create a commercializable system. "One of the biggest missing pieces" needed to make skyrmions a practical data-storage medium, Beach says, was a reliable way to create them when and where they were needed. "So this is a significant breakthrough," he explains, thanks to work by Buettner and Lemesh, the paper's lead authors. "What they discovered was a very fast and efficient way to write" such formations. Because the skyrmions, basically little eddies of magnetism, are incredibly stable to external perturbations, unlike the individual magnetic poles in a conventional magnetic storage device, data can be stored using only a tiny area of the magnetic surface—perhaps just a few atoms across. That means that vastly more data could be written onto a surface of a given size. That's an important quality, Beach explains, because conventional magnetic systems are now reaching limits set by the basic physics of their materials, potentially bringing to a halt the steady improvement of storage capacities that are the basis for Moore's Law. The new system, once perfected, could provide a way to continue that progress toward ever-denser data storage, he says. The X-ray spectrograph is "like a microscope without lenses," Buettner explains, so the image is reconstructed mathematically from the collected data, rather than physically by bending light beams using lenses. Lenses for X-rays exist, but they are very complex, and cost $40,000 to $50,000 apiece, he says. But an alternative way of reading the data may be possible, using an additional metal layer added to the other layers. By creating a particular texture on this added layer, it may be possible to detect differences in the layer's electrical resistance depending on whether a skyrmion is present or not in the adjacent layer. "There's no question it would work," Buettner says, it's just a matter of figuring out the needed engineering development. The team is pursuing this and other possible strategies to address the readout question. Bad writing. Moore's Law refers to rate at which processor density or cost will improve. It is not about data storage. And it's also not about just whether processors improve at all. It is the *speed* at which they improve. If your processor density isn't doubling (or the cost halving) in 18-24 months, it's not Moore's Law. And it is not Law. It was an observation at the time.